d silk printing contain the lead, but the lead content doesn’t exceed 300ppm. Fan features a 5′ cord, 120 volts, 0.28 amps, 33.6 watts and 9 cmb/minute. Fan weighs 2.4 lb. Colors vary slightly due to manufacturing process but are an off white/beige color. 6″ Clip-On Personal Fan mounts wherever needed. Strong, easy-to-open clamp with rubber grips holds tight while preventing scratches. Fan is equipped with two-speed operation and adjustable tilt mechanism. The mounting clip opens 2″. The power cord and silk printing contain the lead, but the lead content doesn’t exceed 300ppm. Fan features a 5′ cord, 120 volts, 0.28 amps, 33.6 watts and 9 cmb/minute. 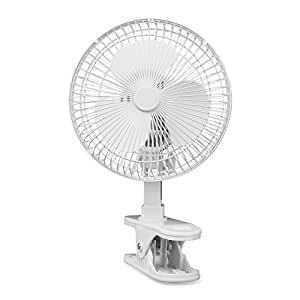 Fan weighs 2.4 lb.